This paper reports on recent work that is directed at understanding the fundamental controlling mechanisms of multi-scale, environmental weathering of nano-structured cement-based materials through an integrated experimental and computational program. 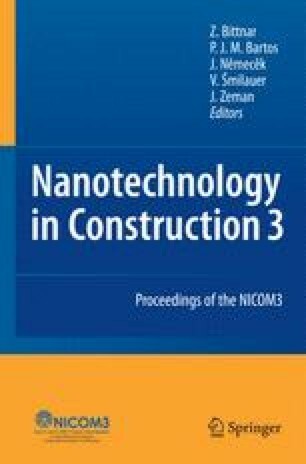 The effect of surface treatment and admixture addition on the incorporation of carbon nanofibers (CNFs) in cement composites was studied. Silica fume and surface treatment with nitric acid facilitated CNF dispersion. The CNFs were found as individual fibers anchored in the hydration products throughout the cement pastes and as entangled networks in cavities. The presence of the CNFs did not modify the compressive or tensile strength of the composite but did provide it with a fair level of mechanical integrity post testing. Preliminary results on durability indicated a residual effect of the CNFs after decalcification of the composites as manifested by a slow load dissipation after peak load under compression. Molecular dynamics modeling of the reinforcing structure-cement phase interface demonstrated that manipulation of the interface characteristics may provide a method to control the composite properties.